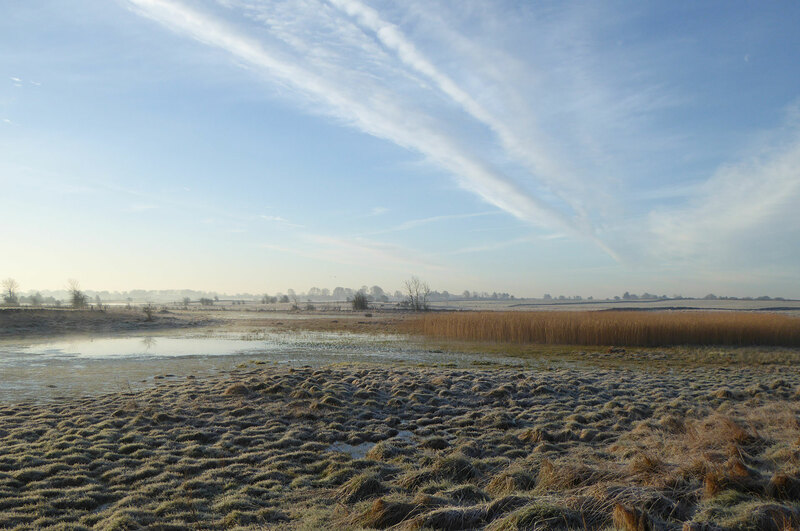 Our staff are currently undertaking a number of winter bird surveys to inform both the Environmental Impact assessments and Appropriate Assessments being prepared for a number of proposed wind farms. We recently took photos of Annex I listed Greenland White-fronted Geese Anser albifrons flavirostris and Whooper Swan Cygnus cygnus during surveys in the Irish Midlands. 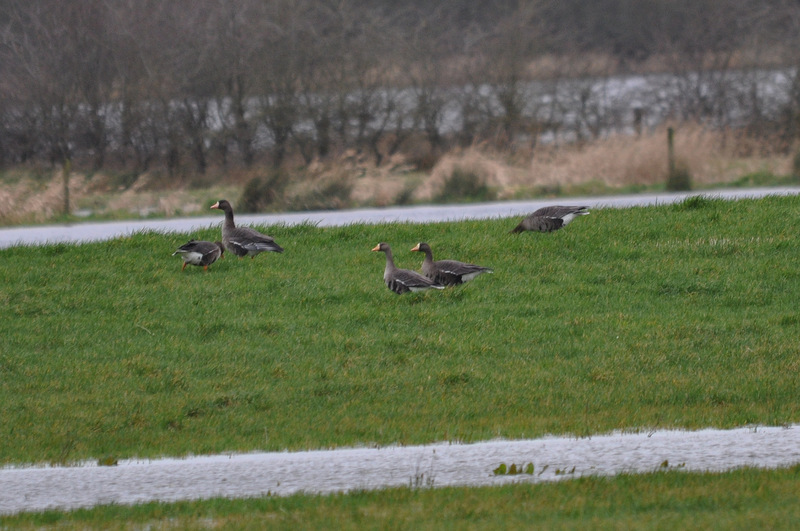 We have also included below some photos of a small flock of Greylag geese Anser anser. The photos of the Whooper Swans and Greylag Geese are from a former Bord na Móna peat extraction site in the Midlands; areas which are increasingly being used by birds of conservation importance. Both ourselves and others have recorded Greenland White-fronted geese using these cutover bogs in previous surveys; although the current photos are from callows in the Shannon catchment. The Greenland White-fronted Geese is one of Europe’s rarest geese, and the species is listed on Annex I of the EU Birds Directive. The Greenland White-fronted Goose is also categorised as ’Endangered’ using the IUCN‘s global Red List criteria. A Draft International Single Species Action Plan for the the Greenland White-fronted goose was recently agreed by the AEWA. This species is also listed under Appendix II of the Bonn Convention. The Greenland White-fronted Goose is one of four subspecies of the Greater White-fronted Goose. They breed in west Greenland and migrate through Iceland to Ireland, and northern and western Britain. Numbers of these geese declined from a peak of 35,600 in 1999 to just 22,600 in 2010; a result of long-term reductions in breeding success. According to Birdwatch Ireland, there have been large-scale declines in some of the smaller flocks that were formerly scattered in reasonably healthy numbers throughout Ireland. Greenland White-fronted Geese were once numerous and widespread throughout the bogs and marshes of Ireland, but due to pressures from hunting, changes in land use and increasing human disturbance the population has severely declined. The geese we observed during the current surveys were aware of our presence despite these photos being taken from a significant distance away. It is clear that these birds are still subjected to persecution such as hunting and shooting, and are very sensitive to disturbance. Birdwatch Ireland note that “they [Greenland white-fronted geese] were formerly recognised as a peatland species, although they now feed most commonly on agriculturally improved grasslands“. They note however that for some flocks there remains a link to their traditional peat bog roost sites; and this is supported by previous ECOFACT, NPWS and Birdwatch Ireland records, which confirm that these geese do occasionally use these cutover bog sites. The Greylag geese recorded this week were probably feral, and small flocks of feral Greylag geese have been recorded on Midlands cutover bogs in the past, for example by NPWS (2008). 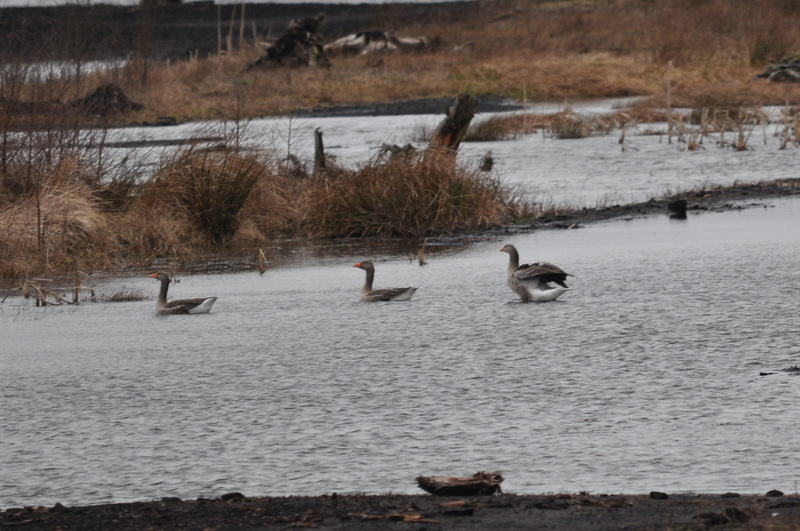 Ireland supports a wintering population of Greylag geese that come from Iceland. The Icelandic population winters in Scotland and Ireland, but mostly at coastal sites and in larger flocks than we saw this week. The wild Greylag goose is an Amber-listed species in Ireland. NPWS (2008) note that “it is probable that small numbers of birds of Icelandic origin do occur at other sites from time to time, and this has been confirmed by occasional reports of Icelandic birds (confirmed by ring sightings) elsewhere“. NPWS (2008) said that the peak winter count of Greylag geese was 6,316 in November 2007 “includes an estimated 1,747 birds counted the following autumn which are from the feral population, thereby leaving 4,569 birds from the Icelandic population“. The Greylag geese we saw this week were also very wary and nervous so they could potentially have been winter migrants. However, the two groups cannot be told apart, unless (1) they are recorded during the summer months, or (2) if rings are visible, for example. This NPWS (2008) report recommended controlling the feral population of Greylag geese, especially at sites where numbers are large and increasing. There were significant number of Whooper Swans on one of the flooded cutover peat sites we surveyed this week. Whooper Swan is also listed under Annex I of the EU Birds Directive and are further protected under Annex II of the Berne Convention. 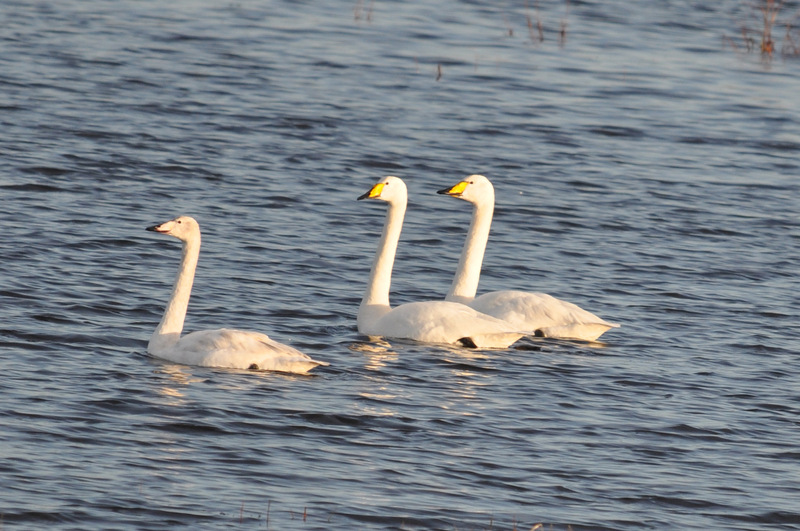 Whooper Swan is an amber listed ‘Birds of Conservation Concern in Ireland’ due to more than 20% of the European wintering population occurring here. The Whooper Swan is however an abundant species globally. Most Whoopers Swans from the Icelandic population spend the winter in Britain and Ireland. Of this Icelandic population, a wintering population of 9,748 were estimated to occur within Ireland in January 2005. There were over 100 Whooper swans (and some Mute Swans) at one of the sites we surveyed this week on one of these old Bord na Móna industrial peat bogs, which is an Internationally significant observation. These Whooper Swans are both roosting here at night and spending the day feeding in this bog. The bog here is currently flooded and this has made it more attractive for Whooper Swans at the moment. However, observations like this illustrate the importance of some old midland industrial bogs for wintering birds, such as Whooper Swans. Other photos from our winter bird surveys, including photos of Greenland white-fronted geese and Whooper Swans in the Irish Midlands, can be found in our winter bird surveys 2012-13 photo gallery. ECOFACT is the leading Irish independent provider of bird surveys and assessments. We specialise in providing ecological and ornithological impact assessment for proposed wind energy developments. For further details please do not hesitate to contact us.